The night before you want to bake (or a few hours) put the dates in a big bowl and just cover them with boiling water. Leave them to cool completely. When they are cool, drain the water off into a separate bowl. Weigh it. If it is less than 600 grams, top it up with water to reach 600 grams. While you wait for the dates to cool, you can dry roast the walnuts, breaking them into small pieces before you do. You have to let them cool completely too before you add them to the dough. Hot walnuts will kill the yeast. 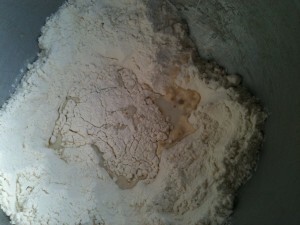 When you are ready to put the dough together, measure the flours into a big bowl and make a well in the centre. Measure in the yeast and cover it with enough of the liquid to fill the well. Flick flour into the well and give it a little stir and leave it for an hour. This makes a little "predough" which helps the bread rise. This is not necessary, however, with the dates and the nuts and the butter, this is not a light dough so every little helps. While the predough is resting, you can melt the butter and let it cool. After an hour, add all the other ingredients except the walnuts. Yes, add the dates too. 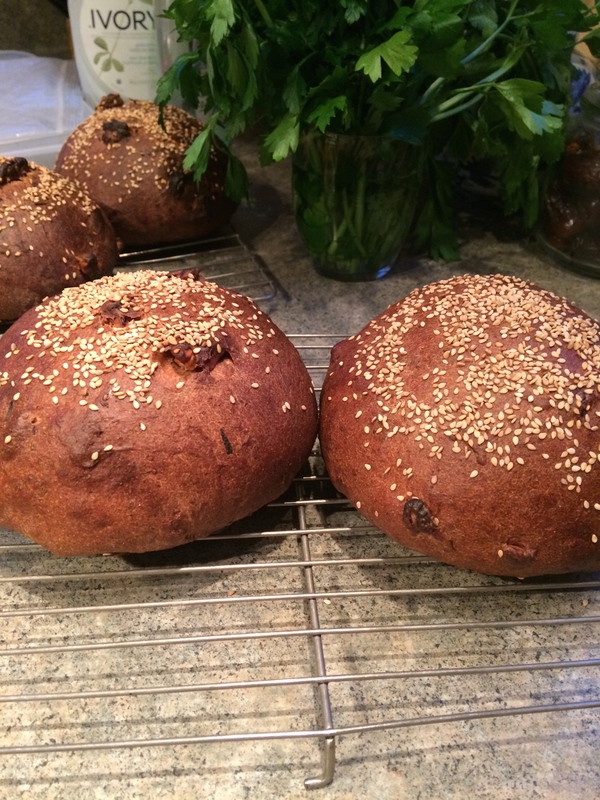 Unlike other kinds of fruit bread, you want to knead the dates into this dough - they smush in so that you see little flecks of them, but you are not interested in preserving their shape. Mix everything together and then scrape it onto a non floury surface. Knead for 10 minutes by hand (or by machine). The dough is very soft and sticky but don't add more flour. A scraper will help if you are hand kneading. Once kneaded, put the dough back into the bowl and cover it with cling film or a shower hat. Let it rest for 2 hours. Set a timer for 30 minutes. 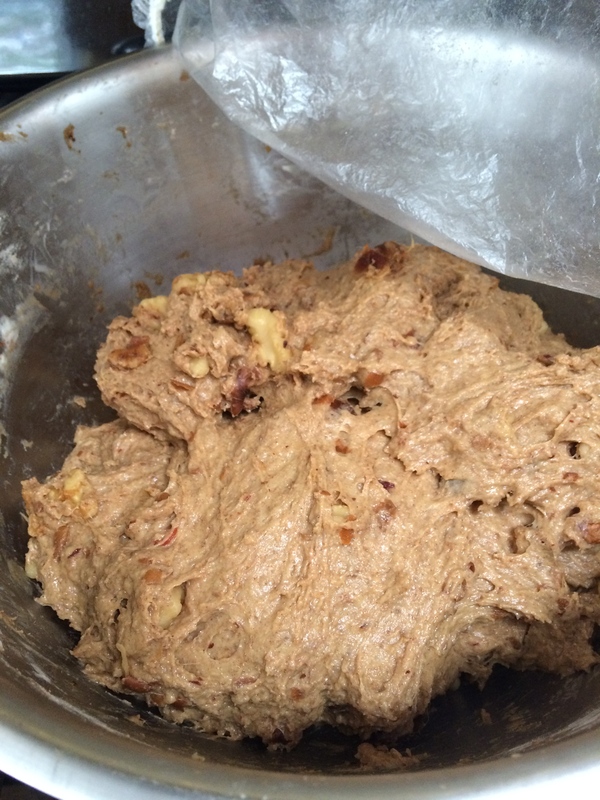 When the timer goes off, add the walnuts, gently folding them into the dough so they are evenly distributed. Let the dough rest for a further two hours. After the first 30 minutes, stretch and fold it. After the second 30 minutes, stretch and fold it. Then let it rest for one hour. Stretch and fold the dough in the bowl to maximise the rise. 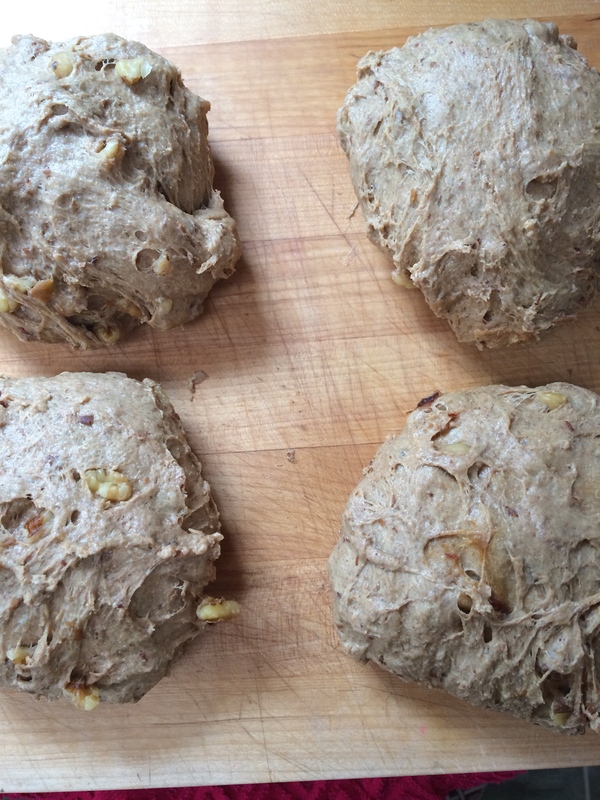 Scrape the dough out onto a non floury surface and divide it into however many loaves you want. 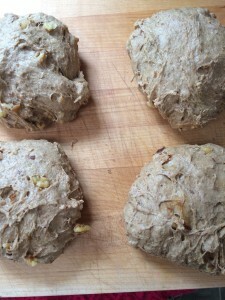 Shape them into loose balls to let the dough relax before you shape them. You can watch a little video here about how to shape a loose versus a tight ball. You can get 4 neat loaves out of this or 3 larger ones or 2 honking great big ones. Shape it however you like - for a tin, for a basket, or free form. Cover them loaves and let them rest for 45 minutes to 1 hour - until the dough has doubled in size and passes the "finger probe test". When you prod the dough gently with your finger, the indentation should come out completely within a minute. Preheat the oven to 400 degrees. 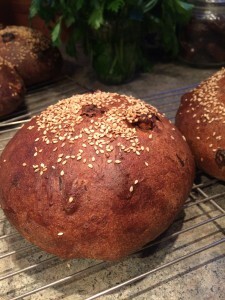 You may want to brush some kind of milk or egg glaze on these loaves to give them a nice, shiny finish and decorate them with seeds of some kind. You don't have to! Pop the loaves in and let them bake for 45 minutes. Check them after about 20 minutes and if they are getting too brown, cover them with non stick baking parchment. When they are done, they will sound hollow when you tap their bottoms and they will be 98 degrees C on the inside (you can check with a probe thermometer). Remove and let cool completely on a wire rack. Interested and want to learn more? Click here to take a fantastic, friendly baking course with us. regular ground flour is fine. Stone ground is a better product but if you cannot get it, just normal flour!